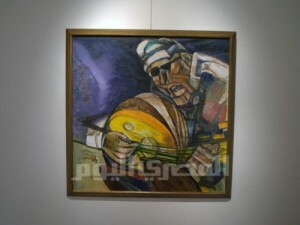 Bahgory on Revolution” will be on view at Al Masar Gallery, Baehler’s Mansion, 157B, 26 July Street, Zamalek, Cairo, until 7 February 2012. The gallery is open from 11:00 am to 9:00 pm, Saturday through Thursday. 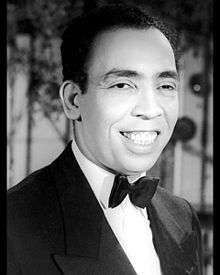 Ismail Yasin (also credited as Ismail Yasseen; Arabic: إسماعيل ياسين‎ IPA: [esmæˈʕiːl jæˈsiːn]) (September 15, 1915 − May 24, 1972) was an Egyptian comedian/actor. He is famous for a series of films with his name in the title. Ismail Yassin had a difficult childhood in Suez where he was born. His mother died at an early age and his father was jailed thus forcing him to leave school before completing his primary education. He worked as a parking valet to support himself. He started his career as a monologue singer and headed for Cairo after Abo El Seoud El Ebiary, the comic screenwriter and his best friend and life partner had discovered him and had helped him to join Badi’a Masabny’s troupe. His break into the movie industry came when Fouad El-Gazaery gave him his first role in the movie “Khalf El-Habayeb” in 1939. 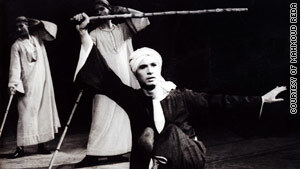 He later joined Ali El-Kassar‘s troupe and started to gain widespread recognition eventually becoming one of most popular stars in the Arab world. A record 15 movies used his name in their titles to capitalize on his fame, most of them was written by Abo El Seoud El Ebiary. He was not particularly attractive but he had great control of his facial expressions and often made fun of his ‘large mouth’ in his films. His trademark gimmick was to act terrified bringing his wobbling knees together, stretching his shaking arms in front of him, stammering silently, and suddenly snapping out of his panic with a loud inhalation of air. In the 1960s his health began to deteriorate. He moved to Lebanon where he participated in a number of films, and later when he returned to Egypt he was heavily in debt. He died of a heart attack in 1972. His son, Yasin Ismail Yasin, is also famous Egyptian film director. Mahmoud Reda graduated from the Faculty of Commerce at Cairo University in1954. He was raised in an Egyptian family that encouraged the pursuit of both sport activities and artistic endeavors. During his years at university, he competed in the 1952 Olympics in Helsinki, and received the gold medal in free exercises in The Pan Arab Sports Championship in 1950 His sport activities were accompanied by an increasing love for dance. 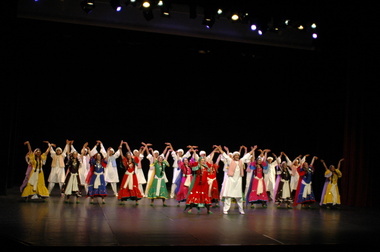 He realized that Egypt had a rich wealth of cultural heritage that needed to be presented on stage in a dance form. Ramzi Yassa (born 1948) is an Egyptian pianist. An outstanding member of the first batch of musicians trained at the Cairo Conservatory, Yassa graduated in Moscow’s Tchaikovsky Conservatory, taking part in the 1974 Tchaikovsky competition, where he earned an Honorary certificate. He then launched a concert career, settling in Paris. Three years later, he was the first Egyptian pianist to win a major piano competition – the ‘Paloma O’Shea’ Santander International Piano Competition. Farouk Hosni, en abstract maler. Hosny er født og opvokset i Alexandria. Han er uddannet fra Alexandria University ‘s School of Fine Arts i 1964 og efter endt uddannelse rettet Al-Anfoushi Kulturelle Palace i flere år. Hosny holdt udstillinger verden over og vandt det japanske Soka Gakai International University kulturelle og fredsprisen . (fra Wikipedia). Zahi Hawass: (født d. 28. maj 1947 i Damietta, Egypten) er en egyptisk arkæolog, ægyptolog og den nuværende sekretær general af den egyptiske organisation Supreme Council of Antiquities. Han har også arbejdet med arkæologiske udgravninger i Nildeltaet, det Libyske ørken, og Oppe og Nedre Egypten. Hawass ønskede egentlig at blive Jurist, men valgte i stedet at studere Græsk og Romersk arkæologi ved Alexandrias universitet, hvor han modtog en Bachelor grad. Han fik senere et diplom i Ægyptologi ved Kairos universitet, derefter fortsatte han hans studier ved University of Pennsylvania, hvor han i 1987 modtog sin doktor grad (Ph.D). Efter 1988, studerede han egyptisk arkæologi, historie og kultur, mest ved American University in Cairo og University of California, Los Angeles. I 1998, blev han udnævnt som “secretary of state and director” af Giza palteauet. I 2002 blev han udnævnt som general sekretær af Egypten- af Supreme Council of Antiquities. (Fra Wikipedia). Sayed Darwish ( arabisk : سيد درويش; 17 marts 1892 – September 15, 1923) var en egyptisk sanger og komponist, der blev anset far til egyptiske populær musik. Han blev født i Alexandria den 17. marts 1892. Han satte musik til den egyptiske nationalsang, Bilady, Bilady, Bilady , ord, der var tilpasset fra en berømt tale af Mustafa Kamil . Darwish døde af en blodprop i hjertet en kokain overdosis i Alexandria den 15. september 1923 (31 år). fra  Tilfældigvis på dagen for hans død, den nationale egyptiske leder Saad Zaghloul tilbage fra eksil, egypterne sang Darwish’s nye sang ” Bilady, Bilady, Bilady “, som skulle blive nationalsang i 1979. المخرج الشهير لارس فون تيير ينافس على السعفة الذهبية لمهرجان كان هذا العام بفيلمه «ميلانكوليا» الذى تشارك فى انتاجه الدانمارك والسويد وفرنسا وألمانيا، ويقوم بالبطولة كريستين دونست وشارلوت جانسبورج وهو يدور حول مايكل جوستين والذى يحتفل بزواجه فى منزل شقيقة الزوج، ولكن يقترب كوكب ميلانكوليا من الأرض فيسود جو الكآبة على الأحداث مع اقتراب الخطر. تيرير الذى كتب السيناريو قال فى المؤتمر الصحفى: «الفيلم» بالنسبة لى هو ليس فيلما عن نهاية العالم ولكن عن حالة الذهن: ميلانكوليا يحكى قصة كوكب على وشك التدمير، فما الذى يقلقنا إذا كنا كلنا سنموت فى كل الاحوال». وأضاف «لقد اختبرت هذا فى حياتى مرات عديدة وأنا أحب المعاناة والإحساس بالذنب الذى يعبر عنه ميلانكوليا، فالحزن موجود فى الفن وجزء لا يتجزأ من الأشكال الفنية الأكثر نجاحا حتى وأنا أقدم أعمالا كوميدية تصبح فى النهاية كئيبة!». ووجه أحد الصحفيين سؤالا لبيير فى المؤتمر عن تحدثه عن النازية وإعجابه بها دائما فأكد ذلك قائلا «كنت أعتقد انى يهودى إلى أن اعترفت لى والدتى أنى ألمانى قبل وفاتها ولست يهوديا وعلى الرغم من أنى أحببت كونى يهوديا إلا أننى اكتشفت أنى ألمانى وأصبحت نازيا وهو ما أعطانى سعادة لم أكن أتوقعها فأنا افهم هتلر وهو ليس الرجل الذى تعتبره من الرجال الجيدين ولكنى أفهمه جيدا كما أنى لست ضد اليهود». Mounira El Mahdeya (born Zakiyya Hassan) (Arabic: منيرة المهدية‎) was an Egyptian singer born in 1885 in Alexandria; she died in 1965. 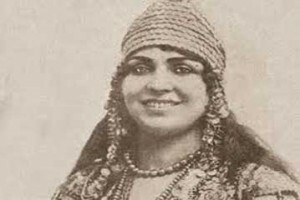 The singer, better known under the nickname of “Sultana of the song” or “The Sultana”, was considered to be the leading Egyptian singer between the two wars.